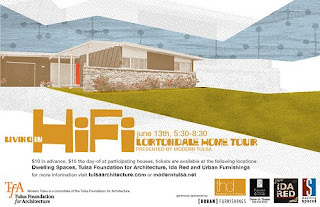 Living in Hi Fi is the first annual modern home tour presented by the Tulsa Foundation for Architecture's Modern Tulsa Committee. Please join us June 13th beginning at 5:30 pm in the Lortondale neighborhood, located just east of South Yale between 26th Street and 27th Place (map). Cost is $10 in advance or $15 on the tour. The tour will feature six homes in various stages of renovation/restoration- from Mid-Century basket case to contemporary showplace. Visitors will be able to view the homes inside and out and meet the owners. A map of the six homes and more information will be printed on the tickets. Cameras are welcome, but please no pets except service animals. The tour is scheduled from 5:30 pm until 8:30 pm. An after party will begin at 8:30 pm, and all tour attendees are invited. Tickets are available in advance at Dwelling Spaces, Urban Furnishings, Ida Red Boutique and the Tulsa Foundation for Architecture office at 2210 S Main. Tickets can also be purchased at any of the homes on the tour- just follow the signs. Sounds like a very cool tour. I am still trying to get my ahead around "modern" what it is and what it means and why its different. I'm going to be out of town so its my loss.